In case you missed our live, online educational seminar, “Metabolic regulation of immunity: Exploring programs that drive immune development and function” we wanted to let you know that it is available in our complimentary on-demand archive. You can access this archive to watch the webinar at any time. 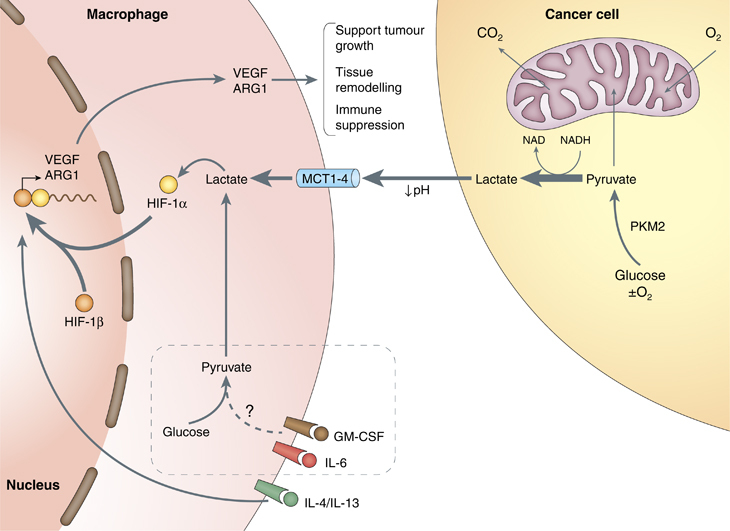 According to conventional thinking, metabolic changes related to disease are thought to be triggered predominantly by signals from the immune cell-signaling network. However, recent evidence supports a role for metabolism as a “first responder” that can be decisive in actually forming immune responses and determining outcomes based on the metabolic potential and fitness of the responding cells. This new insight has led to the potential for reprogramming cellular metabolism to direct immune cell fate and function and thus to ultimately improve disease outcomes. In this webinar we will explain how metabolic pathways and substrates have been found to impact particular immune cell subsets and their functional roles. The application of this knowledge to better understand disease and to reveal novel therapeutic approaches will also be discussed. • Answer your questions live during the broadcast! 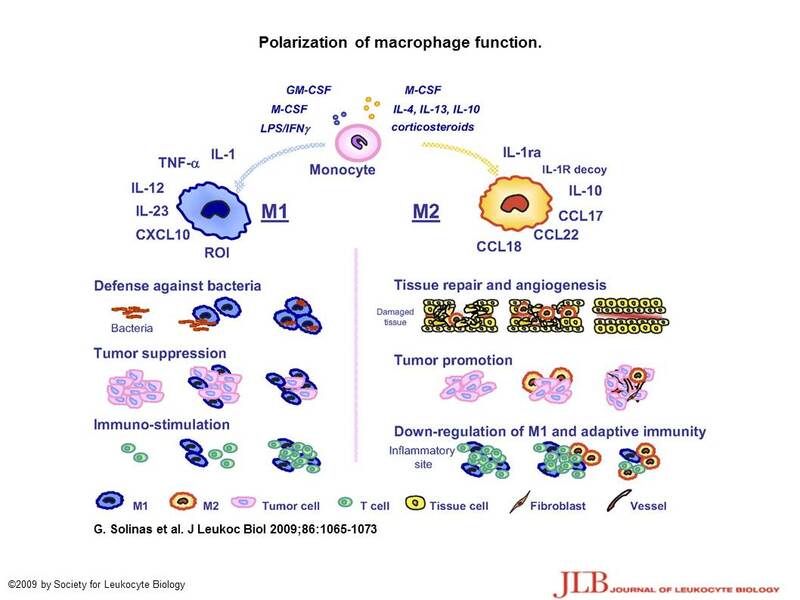 Tumor Associated Macrophages: The Double-Edged Sword Resolved? Writer/Curator: Stephen J. Williams, Ph.D.
Cell-based immunity is vital for our defense against pathologic insult but recent evidence has shown the role of cell-based immunity, especially macrophages to play an important role in both the development and hindrance of tumor growth, including role in ovarian, hematologic cancers, melanoma, and breast cancer. In the past half century, new immunological concepts of cancer initiation and progression have emerged, including the importance of the harnessing the immune system as a potential anti-cancer strategy. However, as our knowledge of the immune system and tumor biology has grown, the field has realized an immunological conundrum: how can an immune system act to both prevent tumor growth and promote the tumor’s growth? As discussed in the lower section of this post, authors of a paper in the journal Science show how different populations of tumor-associated macrophages (TAMs) may exert both positive and negative effects on tumor cells, producing a sort of ying-yang war between the tumor and the immune system. Figure. 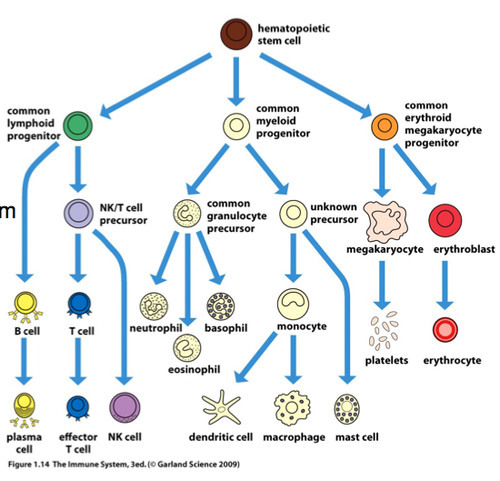 Cell lineage of the immune system. A description of the different cell types can be found here. Histologic evaluation of multiple tumor types, especially solid tumors, reveal the infiltration of diverse immunological cell types, including myeloid and lymphoid cell lineages, such as macrophages and NK, T cell and B cells respectively. Figure. 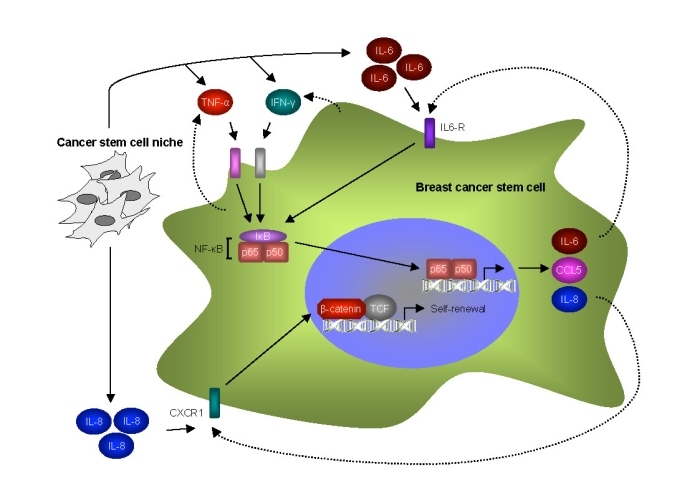 Potential inflammatory signaling pathways in breast cancer stem cells. There are conflicting reports as to the functional consequence of these infiltrating tumor-associated macrophages (TAMs). TAMs have been shown to secrete mediators such as interleukins and cytokines in a paracrine manner such as CCL2, IL10 and TGFβ. In certain instances these cytokines and mediators actually promote the growth of the surrounding tumors. Figure. TAMs can be divided into subpopulations with distinctive functions and secretogogues. 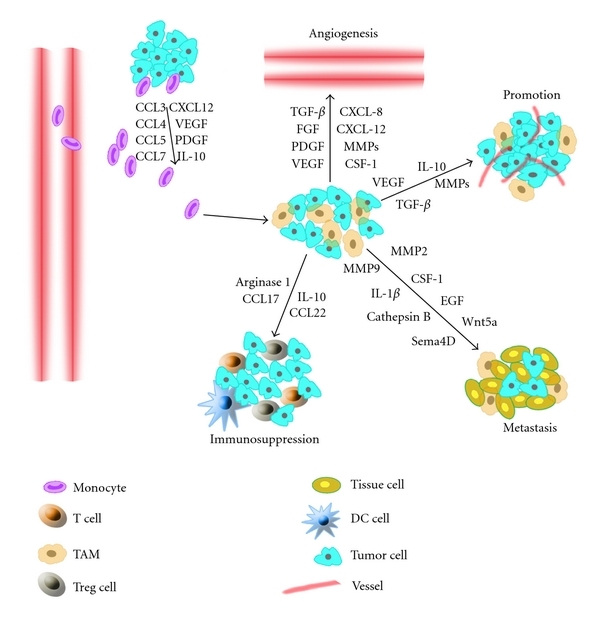 A recent Science paper from Cornel has investigated the origin, function, and characterization of TAMs on breast cancer growth. In summary, their efforts and research suggest different populations of TAMs with varied tumorigenic effects, a finding which may help explain the immunologic conundrum with respect to solid tumors. 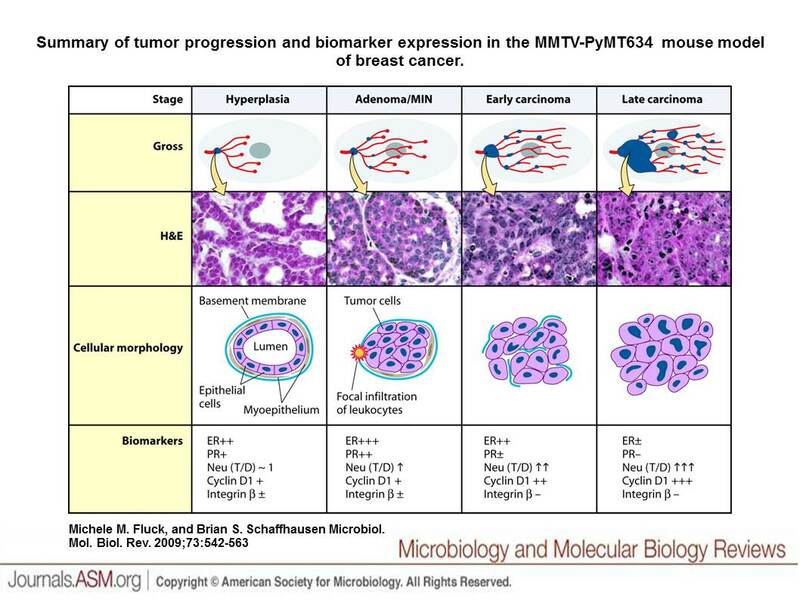 The authors characterized the infiltrating immune cell types in a MMTV-PyMt model of breast cancer. is a transgenic model where mammary gland expression of the polyoma middle T antigen (PyMT) is driven by the Mouse Mammary Tumor Virus promoter (MMTV). Mouse models of breast cancer metastasis. Anna Fantozzi1 and Gerhard Christofori. Breast Cancer Res. 2006; 8(4): 212. Myeloid cells comprised 50% of CD45+ infiltrating leukocytes. The CD45 antigen, also known as Protein tyrosine phosphatase, receptor type, C (PTPRC) is an enzyme that, in humans, is encoded by the PTPRC gene, and acts as a regulator of B and T-lymphocytes. To investigate whether monocytes could differentiate into TAMs in vivo, we transferred CCR2+ bone marrow cells isolated from CCR2GFP reporter mice into congenically marked CCR2DTR PyMT mice depleted of endogenous monocytes, we observed transferred cells in developing tumors demonstrate that tumor growth induces the differentiation of CCR2+ monocytes into TAMs. Transcriptional profiling comparing this population to WT TAMs confirmed a loss of the Notch-dependent program in RBPJ-deficient cells revealing that in the absence of RBPJ, inflammatory monocytes are unable to terminally differentiate into TAMs. mechanisms and molecules involved in the generation of Treg cells remain poorly understood. development and function by specifically repressing Foxp3 expression. impaired their differentiation into CD25+Foxp3+ cells. exhibited more increased suppressive activity than wild-type Treg cells. negatively regulates its transcriptional activity. through direct repression of Foxp3 expression. control the responses of other T cells. comprise 5–10% of peripheral CD4+ T cells (1, 2, 3). they express CD62 ligand (CD62L) and are mainly CD45RBlow (4). rigorously controls their development and function (5, 6, 7). IL-2 production by CD4+ T cells both in vivo and in vitro (8). with differences between in vitro and in vivo results (1, 8, 9). importantly, IL-10 activity has been recently associated with the function of TGF-β-induced CD4+CD25−CD45RBlow cells (13). although with characteristic functional differences (20). the N terminus that is responsible for binding to the IRF consensus element (IRF-E) (21). in the promoters of IFN-αβ-stimulated genes (22). accumulates in response to several stimuli and cytokines including IFN-γ, the strongest IRF-1 inducer (22). nature of the stimuli (21). defective Th1 responses…………. have all been observed (22, 23, 24, 25, 26). is associated with a Th1 immune response (24). diabetes (29, 30, 31, 32). unable to undergo full maturation after stimulation. increased suppressive activity to CD4+CD25+ Treg cells (33). impaired TGF-β-mediated differentiation of IRF-1−/− CD4+CD25− T cells into CD4+CD25+Foxp3+ Treg cells. specifically repressing Foxp3 transcriptional activity. Our results, therefore, highlight a unique role for IRF-1 as regulator of Foxp3, thus pointing to IRF-1 as a specific tool to control altered tolerance. The distribution and the phenotype of CD4+CD25+Foxp3+ Treg in lymphoid organs of IRF-1−/− mice were determined by flow cytometry. FACS analysis of splenic magnetically sorted CD4+CD25+ Treg cells was performed to evaluate the expression of activation markers. IRF-1−/− Treg cells were to a large extent characteristic of a marked activated and differentiated phenotype. IFN-γ secretion was decreased (2.5-fold) compared with cocultures from WT mice (Fig. 2⇑C). As the functional hallmark of Treg cells is their ability to suppress the expansion of effector T cells, we next evaluated this activity performing suppression assays (1, 2, 3, 8). Importantly, CD4+CD25+ Treg cells from IRF-1−/− mice were found significantly more efficient than WT Treg cells in suppressing the proliferation of syngeneic CD4+CD25− responder T cells in a dose-dependent fashion. Next, to verify whether IRF-1−/− Treg cells suppression ability was retained vs WT responder T cells, we performed suppression assays using IRF-1−/− Treg and WT responders and vice versa. The suppressive activity of IRF-1−/− Treg cells toward WT responders was dose-dependently increased, as well. It has been reported in mice and human that TGF-β promotes the induction of peripheral CD4+CD25− T cells into CD4+CD25+ Treg cells (inTreg), that acquire Foxp3 expression and regulatory functions. only 24% of double positive cells were detected in the corresponding coculture from WT mice. compared with 16.5% of Treg cells generated in WT cocultures. induction of Foxp3 mRNA (4.5-fold increase) was detected in TGF-β-treated IRF-1−/− cells compared with WT cells. Of note, these levels were comparable with those present in freshly isolated IRF-1−/− CD4+CD25+ cells. Strikingly, also untreated IRF-1−/− T cells showed higher levels of Foxp3 mRNA than WT untreated cells (6-fold increase) and similar to levels present in freshly purified WT CD4+CD25+ Treg cells. in suppressing proliferation of effector T cells in a dose-dependent way. Interestingly, a saturating amount of anti-IL-10 m Abs neutralized the suppression ability of inTreg cells from both IRF-1−/− and WT mice even though the effect was much more marked in IRF-1−/− inTreg cells. Control Abs did not exhibit any effect. forced expression of IRF-1 in CD4+CD25− IRF-1−/− T cells could rescue the WT phenotype. bicistronic retroviral vectors expressing murine IRF-1 and human CD8 protein as surface marker (MigR1 IRF-1-CD8) or CD8 alone (MigR1 EV-CD8) were generated. Splenic CD4+CD25− cells from IRF-1−/− mice were stimulated with plate-bound anti-CD3 and anti-CD28 Abs and infected with either retrovirus. only 17.7% of MigR1 IRF-1-CD8 retrovirus-infected cells were double positive. strongly supporting the evidence that IRF-1 specifically impairs CD4+CD25+ cell differentiation. To shed light on the molecular mechanisms responsible for the striking effect exerted by IRF-1 on the development and function of CD4+CD25+ Treg cells, we investigated whether IRF-1, which is a regulator of key immunomodulatory genes (21), could directly regulate the foxp3 gene promoter activity. The proximal promoter of human foxp3 gene has been recently characterized and localized at −511/+176 bp upstream of the 5′ untranslated region (38). By the Genomatix software, we analyzed this region and found an IRF-E spanning from −234 to −203 bp . This region has been found highly homologous to mouse and rat foxp3 promoter, and of note, the IRF-E is perfectly conserved between humans and these species (38). To determine whether IRF-1 could bind this sequence, DNA affinity purification assays were performed with cell extracts from Jurkat T cells, which display discrete basal levels of IRF-1, and from the same cells treated with IFN-γ to maximally stimulate IRF-1 expression. A total of 200 μg of nuclear extracts was incubated with oligonucleotides containing the WT or the a mutated version of IRF-E. The isolated complexes were then examined by immunoblotting against IRF-1. A specific binding of IRF-1 to Foxp3 oligonucleotide was evident. The binding was strongly stimulated by IFN-γ treatment and, interestingly, it was comparable to that obtained when the same extracts were incubated with a synthetic oligonucleotide corresponding to C13, the canonical IRF-1 consensus sequence (21). IRF-1 binding was highly specific because a mutated version of the Foxp3/IRF-E, or an unrelated oligonucleotide corresponding to the STAT binding site present on the β-casein gene promoter, did not retain any protein from the same extracts. To functionally characterize the specific binding of IRF-1 to the foxp3 gene promoter, we cloned the encompassing part of the proximal promoter containing the IRF-E from −296 to +7 bp of foxp3 gene promoter upstream the luciferase reporter gene. The effect of IRF-1 was evaluated in Jurkat T cells transiently cotransfected with the luciferase reporter gene and increasing doses of an IRF-1-expressing vector. was substantially reduced in the presence of IRF-1 and the effect was dose-dependent. was not affected by IRF-1 overexpression. the low molecular mass polypeptide lmp2 construct was stimulated by IRF-1 and by IFN-γ treatment, but it was not affected by IRF-2. All together these results demonstrate the specificity and functional relevance of IRF-1 binding to the foxp3 proximal promoter. Foxp3 expression was further increased by IL-2 treatment. To test whether IRF-1 expression was also down-modulated during the acquisition of Treg cell phenotype upon TGF-β treatment, freshly purified TCR-activated CD4+CD25− T cells from both species were cultured with TGF-β, or left untreated, for 3 days and Western blot analysis was performed. When cells were cultured in presence of TGF-β, IRF-1 expression was substantially decreased, as compared with untreated cells. Pull-down assays revealed that IRF-1 binding to Foxp3 oligonucleotide was decreased in TGF-β-treated primary cells compared with untreated cells, as well. Consistently, FACS analysis of these cultures indicated that ∼35% of TGF-β-treated CD4+ cells were Foxp3+ in human and ∼10% in mouse TGF-β treated cultures, respectively. By contrast, even though 46.3% of human untreated cells were CD25+ only 5% were Foxp3+. Next, we assessed the in vivo IRF-1 binding to foxp3 gene in human and mouse primary magnetically sorted CD4+CD25− T cells and CD4+CD25+ Treg cells, using ChIP assay with anti-IRF-1 Abs. After DNA immunoprecipitation, subsequent real-time PCR amplification of the foxp3 gene surrounding the IRF-E site showed significant IRF-1 binding to Foxp3 promoter in CD4+CD25−Foxp3− T cells, and by contrast, a 5-fold decrease of IRF-1 binding in CD4+CD25+Foxp3high human Treg cells (Fig. 6⇑C). Similarly, the binding of IRF-1 to the Foxp3 promoter in the mouse Treg cells was decreased by ∼50%. Finally, to assess the functionality of the in vivo IRF-1 binding, negatively selected primary human and mouse CD4+ T lymphocytes were nucleofected with the Foxp3 luciferase reporter gene along with expression vector for IRF-1. Fig. 6⇑E shows the results obtained with T cells from three different healthy donors and Fig. 6⇑F shows a representative experiment with mouse T cells from three independent experiments. In all samples, a discrete basal activity of foxp3 gene promoter was present and this activity was significantly repressed by IRF-1. The identification of molecules controlling Treg differentiation and function is important not only in understanding host immune responses in malignancy and autoimmunity but also in shaping immune response. 4) forced retrovirus-mediated expression of IRF-1 in IRF-1−/− CD4+CD25− T cells impairs their differentiation into CD25+Foxp3+ cells; and 5) IRF-1 directly regulates transcriptional activity of the foxp3 gene promoter. The phenotypical and functional characteristics of IRF-1−/− Treg cells strongly support the conclusion that IRF-1 can be considered a key negative regulator of CD4+CD25+ Treg cells. may provide a mechanistic base for the reduced incidence and severity of several autoimmune diseases characterizing IRF-1−/− mice . In this regard, it has been recently shown that CD4+CD25+ Treg cells were increased in IRF-1−/− mice backcrossed with the MRL/lpr mice, which showed reduced glomerulonephritis. The increased production of the immunosuppressive cytokine IL-10 by isolated Treg cells from IRF-1−/− mice and the reverted suppression ability of inTreg by anti-IL-10 Abs suggest that this cytokine could play a key role in their suppressor function. Consistently, IL-10 activity has been recently associated with the function of TGF-β-induced CD4+CD25−CD45RBlow cells because their suppressive activity was abrogated with anti-IL-10R Ab treatment (13). Moreover, several reports focused on the in vivo IL-10 role in peripheral CD4+CD25+ Treg cell function in various autoimmunity models (10, 11, 12), although IL-10 seems not required for the functions of thymically derived Treg cells (1). 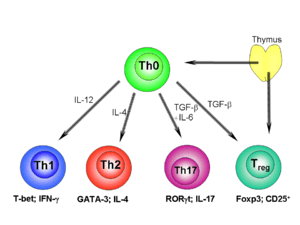 In contrast with the increased IL-10 production, T cells from IRF-1−/− mice failed to produce significant amounts of proinflammatory cytokines such as IFN-γ or TNF-α. Accordingly, an inverse relationship between in vivo IFN-γ administration and generation or activation of CD4+CD25+ Treg cells has been recently shown (45). Moreover, in humans, it has been reported that TNF-α inhibits the suppressive function of both naturally occurring CD4+CD25+ Treg and TGF-β-induced Treg cells, and an anti-TNF Ab therapy reversed their suppressive activity by down-modulating the expression of Foxp3 (46). These latter and our results are apparently in contrast with what was recently reported on the stimulating role of IFN-γ on Foxp3 induction and conversion of CD4+CD25− T cells to CD4+ Treg cells in the IFN-γ KO model (47). In this regard, it is noteworthy to underline that, as it has been also suggested, although knocking down genes involved in up-regulation of IFN-γ expression do not significantly influence autoimmunity, by contrast the absence of genes expressed in response to IFN-γ, including IRF-1, lead to greatly reduced autoimmunity (48). Thus, although the exact mechanism underlying IFN-γ and TNF-α interference with the elicitation of Treg cells remains to be defined, we can speculate that induction of IRF-1 expression, which is up-regulated by IFN-γ and TNF-α, may represent a mechanism through which proinflammatory cytokines negatively affect Foxp3 expression, thereby influencing generation or activation of CD4+CD25+ Treg cells. It is well known that Foxp3 plays a pivotal role in the regulatory functions of CD4+CD25+ T cells both in humans and in animal models. Thus, the key question in the field of Treg biology is which are molecules and signals that govern Foxp3 transcription. that it binds to foxp3 gene promoter in vitro and in vivo and represses its expression. dose-dependent repression of the foxp3 proximal promoter. Notably, treatments with IFN-γ, a major IRF-1 inducer, significantly inhibited foxp3 gene promoter transcriptional activity, whereas IRF-2 did not have any effects. It is noteworthy that the foxp3 gene is highly conserved between mouse and man species, and in particular, the core promoter and the IRF-E identified in this study are perfectly conserved between mouse and human. Such conservation underscores the importance of this motif as regulatory element and provides additional evidence for the role of IRF-1 in regulating foxp3 gene expression. IRF-1 binds this sequence and negatively regulates its expression in both human and mouse cells. The molecular interactions enabling IRF-1 to inhibit Foxp3 are not yet identified, although our preliminary results show that IRF-1 may compete with c-Myb for the binding to the same overlapping consensus sequence on the foxp3 gene promoter. In summary, the current study provides evidence that IRF-1 affects CD4+CD25+ development and function by Foxp3 repression. Thus, our data demonstrate a new important contribution by which IRF-1 affects T cell differentiation and provide new important insights into molecular mechanisms controlling immune homeostasis.